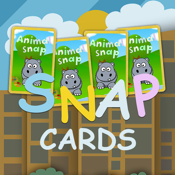 ★★★★★ Animal Snap Cards promises a great fun card game suitable for all ages. It is filled with colourful backgrounds, fun music and most importantly it supports multiplayer using Bluetooth or WIFI. - Identify different types of cute animals. - Learn the names of each animals. - Speed up your snapping reflexes. - Supports up to 4 players. - Allows multiplayer using WIFI or Bluetooth.